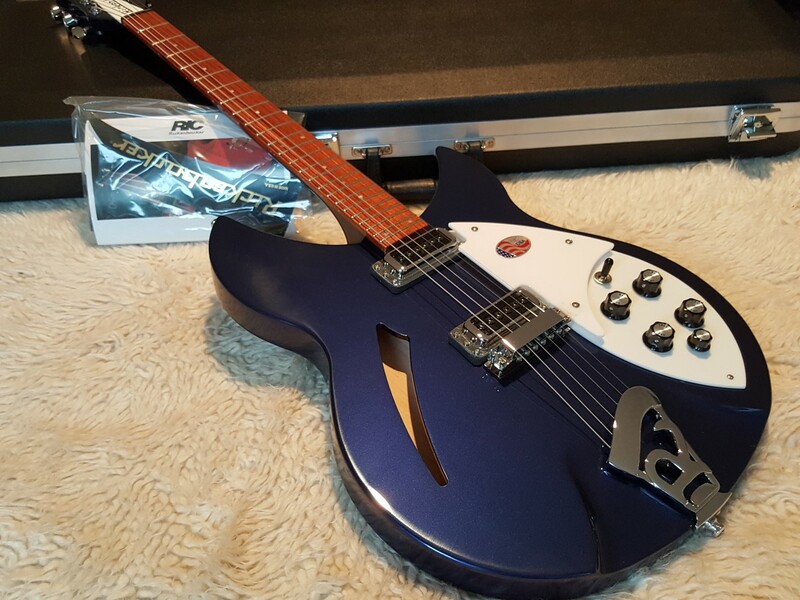 New 2015 Rickenbacker 330/6 String Electric Guitar - Midnight Blue. Limited colour availability. Un-played, Mint, not been a demo in a store. Normally associated with the "jangle" rock tones of the 1960s, the Rickenbacker 330 has carved out it's own identity as the sound of a decade. The sound is so distinct, in fact, that it's tone could arguably be called the sound of an entire decade and an entire British invasion. Two single coil pickups on a full size body are accented by a traditionally shaped sound hole. The 24 fret Rosewood fingerboard is punctuated by dot inlay fret markers, with full double cutaways permitting access to all the frets. Standard output is monaural through a single jack plate. The Rickenbacker 330, has a sound and vibe all it's own. A rock classic from the '60s that's still a favourite today. Its unique hollowbody construction, slim neck, and all-around contoured body make Rickenbacker 330 Electric Guitar so comfortable and so easy to play that it has held its status as one of the great guitars over decades. Its body is carved from a single piece of maple and precision-fitted with a solid back. The maple and rosewood neck features dual truss rods and a rosewood fingerboard with dot markers. Single-coil pickups deliver an output range from clear, ringing tone to saturated overdrive. Includes Rickenbacker hard shell case.